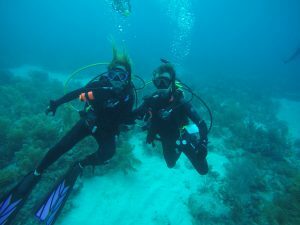 For Thanksgiving Break, my parents and I did something a little unorthodox: we got scuba-certified. When I was in France this summer, I did a “try dive” in the Mediterranean – and when I got home, I immediately told my parents how much fun I had and how badly I wanted to get certified so I could dive on my own. Sure enough, I managed to convince both of them to join in on the journey with me, and a few months later, we found ourselves buying gear, going to a scuba class, and signing up for a Florida Keys dive trip over Thanksgiving. While I’d love to say the whole weekend went off without a hitch, that would be a total lie. The first day of diving was, to put it bluntly, awful. We weren’t aware of exactly how rough the seas were, and ended up going out for a dive amidst 5-7 foot waves. Even as someone who doesn’t normally get seasick, I was just about to die on that boat ride. 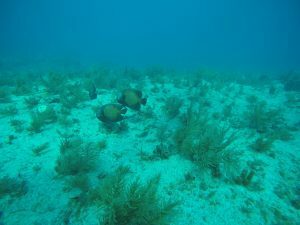 And unfortunately, underwater wasn’t much better, as the surge kept throwing us back and forth and making movement and exploration pretty much impossible. And you know it’s bad when even the dive instructors are concerned. 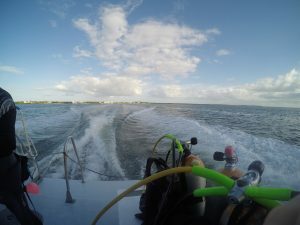 So after that “trial by fire,” we were able to finish off our open water certification dives on Friday in a much calmer lagoon, and by Saturday, we were fully certified divers. Saturday was also the first day we were allowed to use our GoPro during our dive, and it worked out well because that was also the day with the best visibility and coolest creatures. 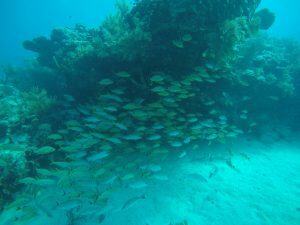 We found a huge school of fish hanging out on the reef. Ok, my parents are the cutest. 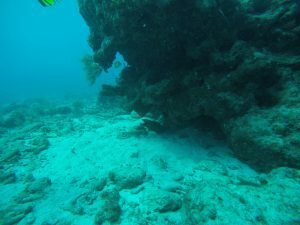 It’s a little hard to see, but underneath the coral there’s a moray eel. 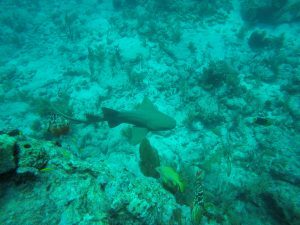 We also saw quite a few sharks while we were out – this one’s a nurse shark, and there were a couple of reef sharks hanging around too (they swim too fast for quality pictures of them though). I, being the person that I am, own all pink dive gear. 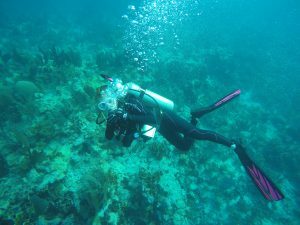 If you’re even vaguely considering getting scuba-certified, do it. It’s so. much. fun.